As a young child, you probably looked at the sky and wondered why and how clouds formed. What are clouds made of and why do they appear that way? There are many types of clouds that have been classified and named by meteorologists over the years. Clouds help predict the weather, with a high level of accuracy that weather reporters look at the clouds to get all the information they need regarding daily weather conditions. Stratiform clouds are only an example of the many different types of clouds that appear in the sky and if you want to learn more about it, read further. Clouds are not magical structures that appear in the skies. They exist for a reason and they are responsible for the weather. More than just beautiful cottony structures, clouds are made up of ice or water. They are formed because air rises and then cools as they expand. During this characteristic expansion, the water molecules within them clump together and they breakdown into invisible vapor that condenses and forms the cloud, which is rather visible. Clouds play a very important function in the water cycle. Since the Earth is made up of 70% water, the Sun’s heat transforms water from liquid to vapor. Through the process of transpiration, water is brought up into the atmosphere and it then cools as it condenses. This condensation process forms the clouds and because these clouds are composed of water, they are eventually released back into the atmosphere as rain, hail, snow, or sleet. The precipitate depends on the specific type of cloud that it comes from. Stratiform clouds are only one type of clouds, and they contribute so much to the weather. Physical appearance: These clouds appear gray to white in color and they have large uniform bases. They observe a very distinct horizontal layering of clouds. They are perfectly described as flat, hazy, and featureless. Distribution: Stratus clouds can be seen in various altitudes and in different forms. There are stratus clouds that appear above 20,000 feet, in the high-level altitudes; there are also stratus clouds found between 6,500 to 20,000 feet, in the mid-level altitudes; and lastly, there are stratus clouds that form in the low levels, below 6,500 feet. Mostly, they are low-lying clouds covering the sky. Composition: Stratus clouds are composed of either water droplets or ice crystals, depending on the temperature. Mostly, they are composed of moderate liquid water. Water in these types of clouds carry a maximum value of 1.1g/m3 so ice crystals in them occur, as rime. Precipitation: These clouds usually appear on a cloudy day, and they can bring about snow or drizzle. They are, therefore, associated with bad weather conditions so if you see low lying clouds that are appearing quite heavy, you know that you are looking at Stratiform clouds. Stratocumulus: This type of cloud is shallow, stable and non-precipitating, but sometimes an indication for some rain. They are low and lumpy and are found below 6,000 feet and they can appear in a white or dark gray color. Cirrostratus: These are high-level clouds that are composed mainly of ice crystals. Cirrostratus clouds appear to be very thin and they are usually seen to form a halo over the sun. They are sheet-like and they form above 18,000 feet. Altostratus: These are mid-level clouds that form precipitate, and they hardly reach the ground. These clouds are composed of water droplets, ice crystals, or both. They usually indicate an approaching weather disturbance, mostly of rain that is coming in a particular area in about 10 to 15 hours. Nimbostratus: These are dark gray clouds and they are seen below 6,000 feet. The prefix “nimbo” implies that it is a precipitate-producing cloud so you can expect light to moderate precipitation. You may not know this but fog is actually a kind of cloud. They are low lying clouds that creep onto the ground. 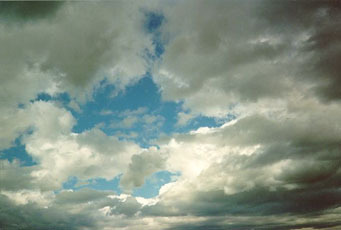 Stratus clouds are low-lying uniform clouds and since they appear to be the lowest types of cloud formations, they are associated to ground-based fog formations. In fact, the meteorological definition of fog is that it is a cloud with a base close to the ground. Fog has the ability to reduce vision to less than 1000 meters and it can bring humidity down to 100%. There are many different kinds of fog that develop in the atmosphere. Frontal fog is formed in front of warm and cold air; Advection fog is formed when humid air moves horizontally; and Radiation fog is the most common type of fog, which is seen in the morning as a result of heat being radiated at night. There are also other kinds of fog in the atmosphere, but these three are the most important and the most common. It is interesting to know how convective and stratiform clouds are very different from each other. First of all, you should know that convective clouds are produced by warm air, and they are dispersed across the sky in a distinctively random manner. Contrary to convective clouds, Stratus clouds are able to cover a larger expanse in the sky because they appear to come in very broad layers, and they are also so much taller and wider than the former. These clouds are usually related to dangerous extratropical cyclone activities and they can cover the whole sky.